Stuck trying to figure out the difference between demurrage and detention charges? You’re not alone. Importers and exporters are often confused by these terms, and it can cause disruptions with shipments at a carrier’s terminal or at a loading location. With over 15 years of experience in the global logistics industry, we are familiar with these tricky terms which is why we want to help you learn exactly what these fees are for and when you might encounter them. What Are Demurrage and Detention Fees? Demurrage and detention charges typically take place when the equipment for an export or an import shipment exceeds the allocated free time either out of the shipping terminal or in the shipping terminal. 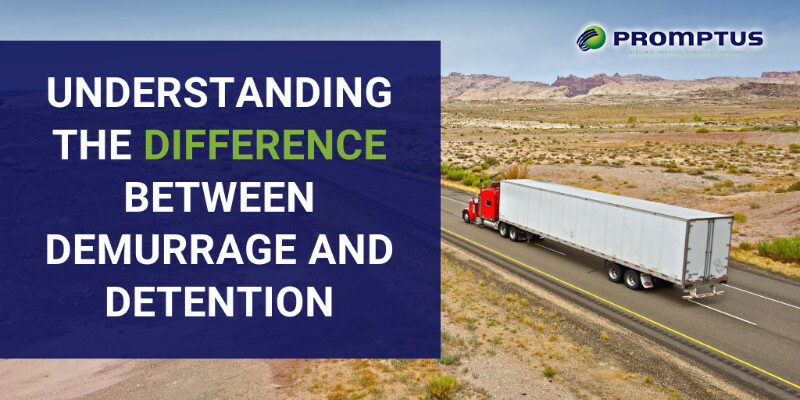 This free time will vary depending on the location, the type of cargo you are transporting, and the terms agreed upon by all parties involved. Normally, it ranges from around 3 – 5 days. When shipping out cargo, you must provide the necessary and accurate shipping documents. If something holds up your goods at the carrier’s terminal and these cannot be shipped on the booked vessel you may be subject to demurrage fees. On an export shipment detention fees will be assessed when the container o equipment that you took from the carrier’s terminal or yard is not dropped off already loaded at the shipping terminal within the allocated free time frame. It can also happen when on a live load scenario, the loading takes longer than the allowed free time. Demurrage charges occur when cargo is left in possession of the terminal for longer than the agreed upon free time. Simply put, these charges start to tack on to your final cost if you do not pick up your loaded container in time from the terminal. Detention fees apply when using equipment from the steamship line out of their terminal and the free time agreed is exceeded. It can also happen when on a live unload scenario, the unloading takes longer than the allowed free time. While unfortunate, incurring in these charges might happen to you. If you find yourself having to allocate additional funds for demurrage or detention fees on a regular basis, you might need to sit down and figure out why this is happening and come up with a plan to avoid it. The best way to avoid hitting snags or being late with pick-ups or drop-offs is to plan the entire shipment carefully. Take time to make sure you cover all the bases, and then double check! Communicating with your team, the trucking company, the port, and even the consignee will help to make sure that everyone is working in sync and any potential problem can be tackle and resolve beforehand. If you will be importing or exporting goods during a busy holiday or using a high-volume port, allow yourself extra time and schedule your trucking services well in advance to ensure you get an appointment within your allowed free time. At Promptus LLC, we take care of these headaches for you. With our freight forwarding and Customs Brokerage services, we can take care of the complicated parts and help reduce the likelihood of demurrage and detention costs. Contact us today at 305-687-1405 to get your free quote for our freight forwarding services!